Who was the big winner? I’m pretty sure it was me. 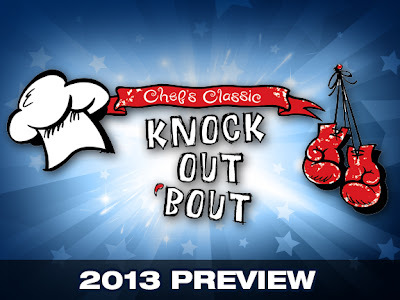 As previously mentioned, Robert and I were invited to be judges at the second annual Chef’s Classic Knock OUT ‘Bout. Unfortunately, Robert had to bow out for a family thing, so I was left to represent Lunch Blog by myself. No worries, though. I showed up to the fight with my appetite, notebook and most severe judgy face -- excited to taste what the contenders brought this year. Ready for a food fight? The second Chef’s Classic Knock OUT ‘Bout is happening this weekend, and your Lunch Bloggers are excited to be judging the competition. In the first two rounds of battle, local chefs will make appetizers and VIP ticketholders will cast votes for their favorite. Then the top two contenders will get in the ring for the mystery ingredient final round, judged by us, Kimberly Winter Stern and Missy Roe. The whole thing will be hosted by Stretch from Grinders. Will Charles d’Albaing of Chaz on the Plaza defend his title? Will Brandon Winn of Room 39 make it to final round again? Or will there be two new competitors vying for the prize? This is our second time as judges at the KOB, and we’re the only returning judges from the first year. It’s like we’re the Randy Jacksons of Kansas City food blogs. The Knock OUT ‘Bout benefits St. Paul Catholic School. Tickets start at $25 and include food and drink, but with a VIP ticket you also get to sample and vote in the appetizer rounds. Check back here next week for a recap of all the action. When: Saturday, April 13, 2013, with doors at 5:30 p.m.
*This tiebreaker method isn’t in the rules. But it should be.